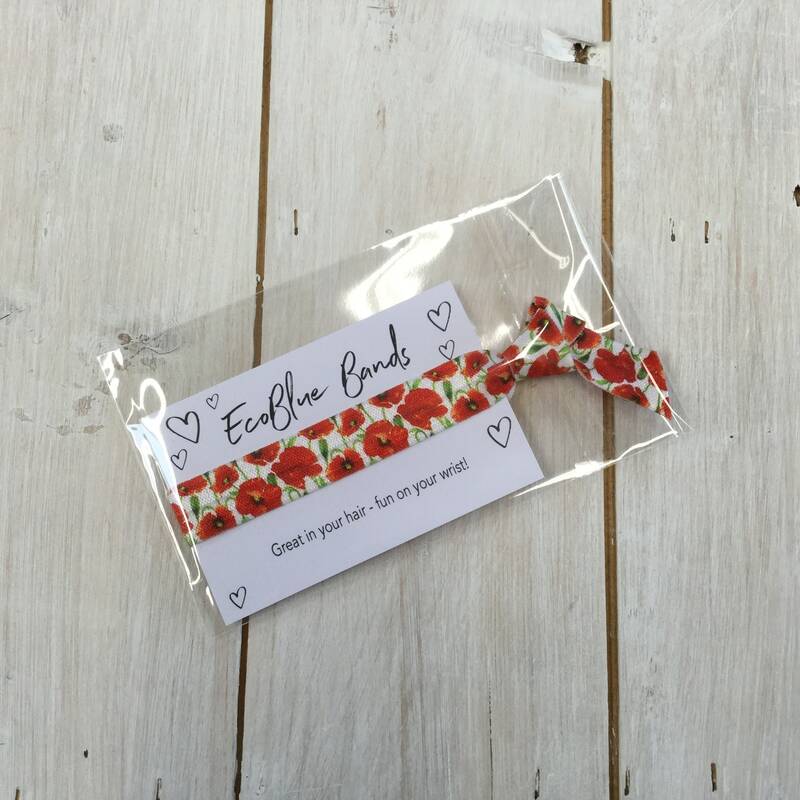 Poppy hair ties that are great in your hair and fun on your wrist. These poppy ties are supplied on single cards, I have made them especially to support the British Legion and the Poppy Appeal. A donation from the sale of every one sold will be sent to the Poppy Appeal. These hair ties are soft and gentle on your hair. 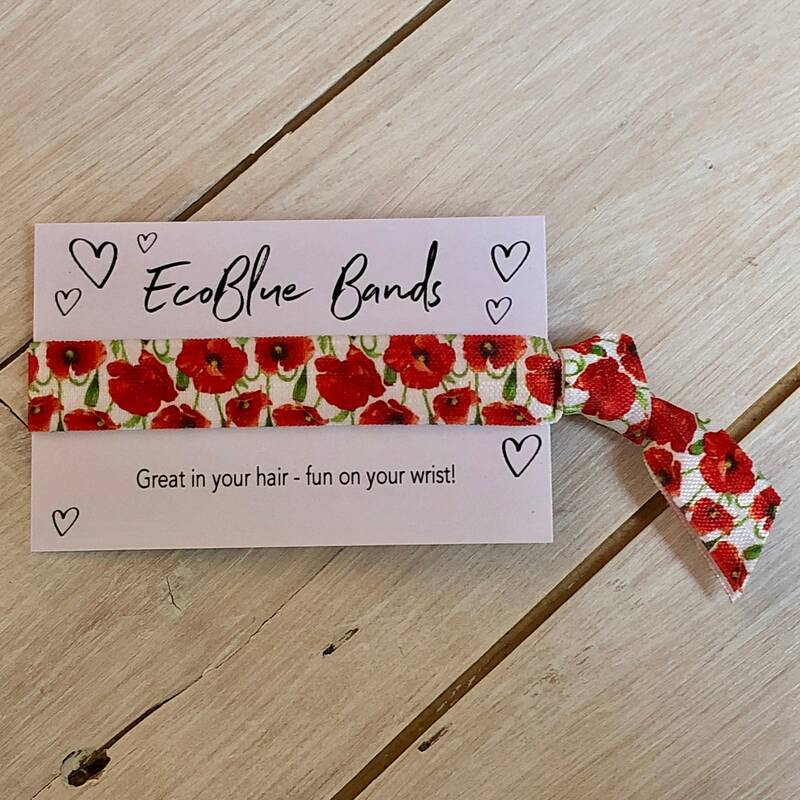 They are washable and great to wear on your wrist when they are not on your hair. I always try and dispatch same day (or next working day). I have lots of these hair ties for sale -lovely choice of colors, all handmade and picked by myself. Please check my other listings. Do email me with any special requests. Supplied on white card. We accept various forms of payment. Please see the checkout for details. We want to offer you the best service. Whenever possible we will always dispatch your items on the same day, or next working day after you order. We have various methods of dispatch available at our checkout. Customers may return new, unopened items within 30 days of delivery for a full refund. Items should be returned in their original product packaging and tags etc must be still attached. The buyer will need to pay for the return shipments. Please return your item with the original packaging, to Ecoblue, PO Box 411, Beckenham, Kent BR3 9BB. Please make sure you enclose your order details and your name and address. We collect, store and process your personal information only for specific objectives. When you purchase products, enquire about our products, or provide us with your personal data we may collect personal data from you, such as your name, address details, your email address and a contact telephone number. We use your information to optimise our service, for example processing purchases and invoicing. We do not sell personal information. We may also disclose your personal data to our supply and delivery partners for the purpose of processing and fulfilling your order. Where such disclosures are made, this will be under contractual arrangements with us and carried out in accordance with the requirements of the Act. Etsy have put in place appropriate procedures to safeguard and help prevent unauthorized access, maintain security of your data, and correctly use any information that we collect online. Where we do have to gather your personal information, you are in control of entering those details and this will always be carried out via a secure page which keeps your information private. Once we have received your personal data, we use strict procedures to prevent unauthorised access. You can exercise this right at any time by contacting us. For this or any other questions please contact us. yes i received the item . its a nice little band. it was a little gift i gave my mum.